I happened to be in Malabon one weekend for a get-together with the wife’s relatives who lived in the area. Malabon is an old town that is often mentioned in history books (i.e., during the Spanish period). Though the name of the town is said to have been derived from the term “ma-labong,” which is short for “maraming labong” or plenty of bamboo shoots, it is likely, too, the place was named after San Francisco de Malabon. Here are a few photos we managed to take as we drove along Malabon’s streets. I was not familiar with the area but Waze and Google maps provided ample information for us to navigate our way around. Gen. Luna Street in the Malabon city proper is a one way street. Other streets in the CBD have also been designated as one-way streets as all (and not just a few or most) roads are narrow. Non-motorized transport are popular in Malabon and you will see a lot of bicycles and pedicabs along the streets. These are usually in mixed traffic and seem to blend quite well with motorized vehicles. This seems to be a good example of practicable road sharing. While the streets are designated one-way for motor vehicles, bicycles and pedicabs generally travel counterflow and oblivious to the risks of doing so. Still, motorists seem to be okay with this and traffic enforcers do not mind the practice. There are many people using bicycles and pedicabs in Malabon. Noticeable are the unique designs of sidecars as the bicycles used in the trikes are taller than the usual bikes elsewhere. 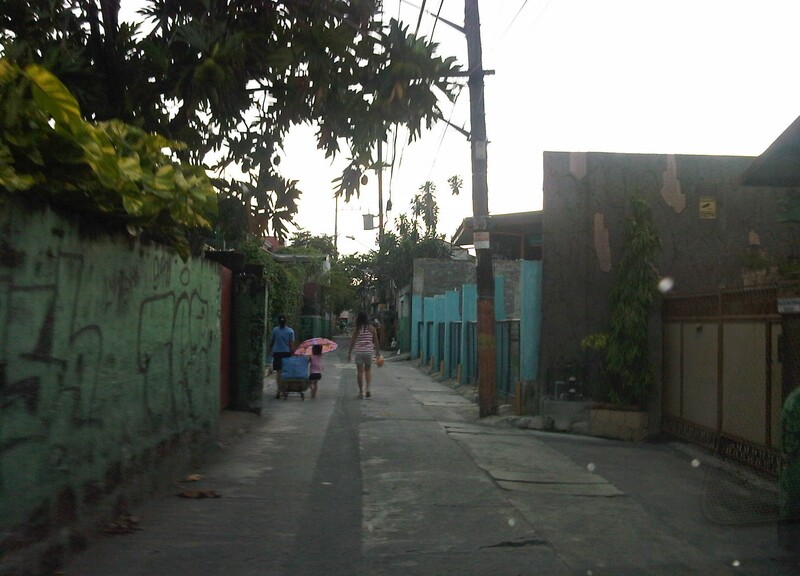 One of the narrow side streets in Malabon. I think these should only be used for walking or cycling and motor vehicles (including motorcycles) should not be allowed to use these. Malabon can be developed as a walkable city and since it has narrow streets, traffic circulation needs take into consideration how to effectively use one way scheme or combinations in the network. Malabon is a flood-prone area. Combined with its narrow streets, the area needs an all weather transport system. Non-motorized transport like bicycles and pedicabs can provide this as well as buses perhaps, though the narrow streets and tight turns at intersections can definitely be tricky for large vehicles. It would be interesting how the city will continue to develop considering the constraints. The town proper itself is challenged in terms of the area available for development and perennial flooding will always be an issue that will be quite difficult to overcome. Still, the city and its citizens persist and have been able to overcome these challenges. It can only be hoped that the city will continue to thrive amidst the challenges. By d0ctrine in Cycling, Highways and Streets, NMT, Paratransit on September 19, 2014 .